Every kitty deserves a castle! This collection of feline fortresses has everything a cat could want–sturdy construction, multiple levels to climb on, cozy hideaways, peep holes, windows and durable scratching surfaces. Choose from three styles: The Fortress which would fit nicely in a corner, the Penthouse, shown above as a perfect window perch, and the ultimate multi-story Chateau with a generous cardboard scratcher on every level. These fantastic cardboard creations are from Petique and can be purchased on Amazon.com. 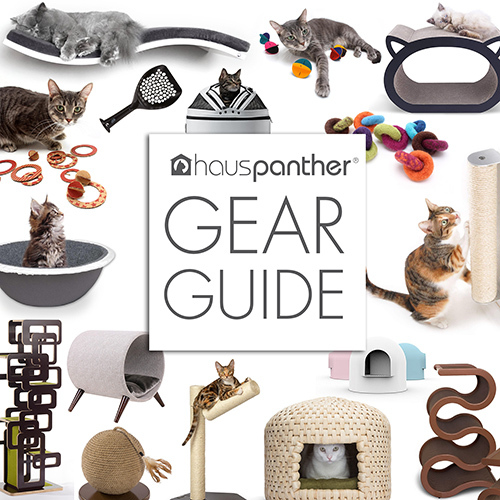 Announcing the Hauspanther & Hepper Cat Cafe Love Giveaway! These castles are wonderful and there’s a design for almost any cat-loving home! Thanks for sharing with us. I love these, I have to get one!